There are two phases planned for the design and construction of the NE Rodney Greenway. The first phase has already started with the construction of speed bumps to calm traffic. Also part of the first phase is the installation of a test diagonal diverter, which is located at NE Rodney and NE Ivy. The diverter was installed in September. The diverter forces vehicle traffic trying to use Rodney as an cut-through route back to the main streets of N Williams Ave, NE Fremont St, or NE MLK Blvd, while allowing bike traffic through. People on foot can also continue to use the route. The map shows the location of the diverter and how vehicular traffic patterns will be affected. The first phase was moved forward in time to coincide with the construction of the improved bike lane, lane changes, and traffic changes on Williams Avenue. Based on feedback from the public last spring, The Portland Bureau of Transportation decided to move up the construction of traffic calming device on Rodney. 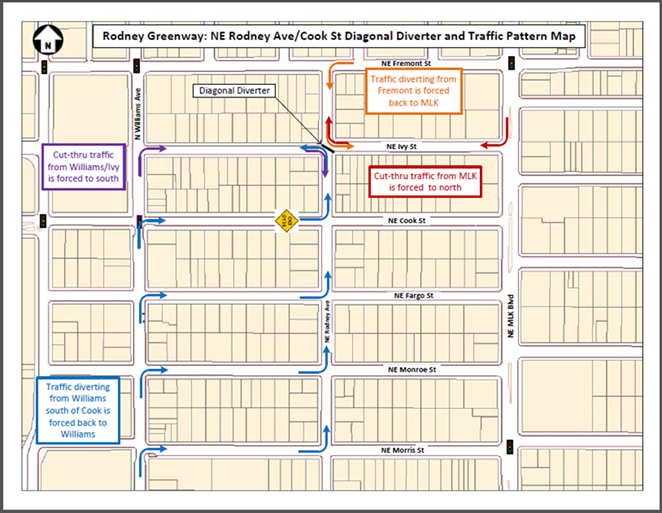 This will allow time to monitor and receive feedback about traffic patterns on Rodney after the Williams street corridor is altered. The second phase will begin this Fall and will include final plan development conversations that will allow for feedback from the community and monitoring of installed traffic calming devices on Rodney. Current planned design elements include upgraded crossing treatments at NE Russell and NE Fremont, turning or installing stop signs to face east-west at all intersections, and making other adjustments from monitoring and community conversations. Your involvement will help make this project safer. Rich Newlands can be contacted at rich.newlands@portlandoregon.gov or by phone at 503.823.7780. This diversion only forces traffic to Fargo and Beech Streets because of backed up am/pm traffic on Fremont Street. A dedicated left hand turn signal at Fremont and Vancouver Ave is what needs to happen to alleviate cut through traffic.